"It's like he's being deliberately ridiculous, trying to attract our attention" suggests Amy as she reads from a history book and the pre-titles of The Impossible Astronaut bounce from the Doctor's encounter with Charles II, where he hides (in a state of undress) under a woman's skirts, then to his escape attempt from a German POW camp and back again to the domesticity of the Pond residence. 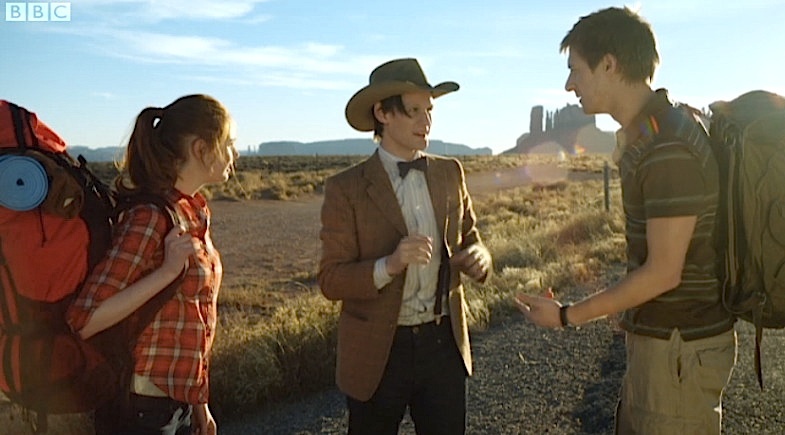 Amy could also be refering to Steven Moffat, with the episode's author gleefully mocking himself, as he throws the Doctor into increasingly absurd sequences to usher in the first episode of Series 6. However, it seems that the Doctor has been doing a bit of temporal stalking (even managing to haunt Rory's Laurel and Hardy movie without him even noticing) in order to gather together his erstwhile companions. 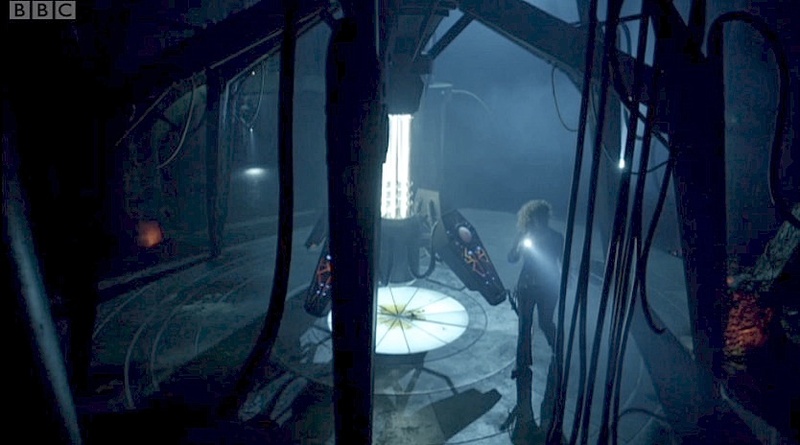 We see mysterious invitations arriving in the post (even River's Stormcage Facility can't defeat the Royal Mail), their TARDIS blue envelopes evoking the "something borrowed, something blue" epiphany of The Pandorica Opens. With River packing for "some planet called America" director Toby Haynes magnificently ramps up the scope of the series with his widescreen, cinematic panoramas of Utah, following a bus as it travels down a highway and drops Rory and Amy onto a stunning vista of blue skies and burning desert. The Doctor's pose, with Stetson, on the parked Edsel is perhaps a subtle nod to the James Dean iconography of Giant (1956), with the actor sprawled across his station wagon as the symbol of an anarchic youth who died before his time, mirroring the Doctor's approaching fate. The expansive Oljato-Monument Valley, Utah, source of so many John Ford westerns, continue to shape our received wisdom of America's landscape with their striking, flat-topped mesas and buttes here emulating the landscape of The Searchers (1956) or Stagecoach (1939). Mix in the Stetsons (that "stetson's are cool" will no doubt usher in a hike in hat sales this summer to match the buoyant popularity of fezes and bow ties, I'm sure. ), River as gun-slinger with her familiar "hello sweetie" greeting, diners full of neon, polished chrome, juke-boxes, Coke and Elvis murals, and you have a complete lexicon of American culture. The summons is clearly of serious import. "I've been running… faster than I've ever run" begins the Doctor as he and his friends settle down in the diner, synchronising his diary with River's to find out exactly where they are in their relationship (much talk of Easter Island and Jim the Fish). "Now it's time for me to stop," he challanges them and the exchange of looks between him and River really hint at what is to come. Gold's music, until this point a cheery extension of his 'I Am the Doctor' theme settles down into a brassy, almost melancholic underscore that's suggests Aaron Copland's 'Fanfare for the Common Man', itself written in response to the US entry into the Second World War. Its associations with American patriotism ironically counter the introduction of a certain Richard Milhous Nixon into the story when they later arrive in the Oval Office. The trip to "Space... 1969" is a little play on the optimism of the space race, complete with the iconography of the NASA spacesuit that we see later, extrapolated from man's achievements through technology and the rediscovery of his humanity that marked out the futurism of everything from 2001: A Space Odyssey through to Space:1999 itself. As they picnic by the shores of Lake Powell, Moffat continues to refer back to the various ticks that he's introduced into the make-up of the Eleventh Doctor - his dislike of wine echoes the amusing sequence with Craig and Sophie in The Lodger - but it's merely there to distract a casual remark where the Doctor reveals his age as 1103, alerting us to the fact that this is a future Doctor, one that is 195 years older than the version Amy last encountered some two months previous. Amy's quick enough to spot this, along with the audience, and he simply deflects her question by rather rudely commenting about her weight gain. That deflection in itself preempts one of the major revelations in the episode about Amy's condition. It's here that we also get our first look at the Silence creature, a bizarre mixture of Edvard Munch's 'The Scream' and the urban mythology of 'men in black' government agents. Their effect on the casual observer, marked out by the swooshing sound on the soundtrack, when the observer turns away from them, is to forget they ever noticed them. An enemy whose stealth marks Moffat's return to the theme of the creation and eradication of memory, of remembering and forgetting, that ran throughout the series last year. Here, he's very effectively turned it into the monster's raison d'être and imbued the creatures with all the psychological fears that Munch's imagery claims to visualise as well as the folkloric symbolism of the devil that The Mothman Prophecies author John Keel attached to the extraterrestrial origin of the 'men in black'. 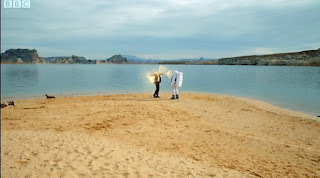 The encounter with the astronaut during the picnic at Lake Powell (another iconic location that saw impossible astronaut Taylor plunge from his own timestream and into the lake on the Planet of the Apes in 1968) ties the story into the moon landings of 1969 which, in Moffat's diversionary style, is where the audience, and Rory, think the story is going. 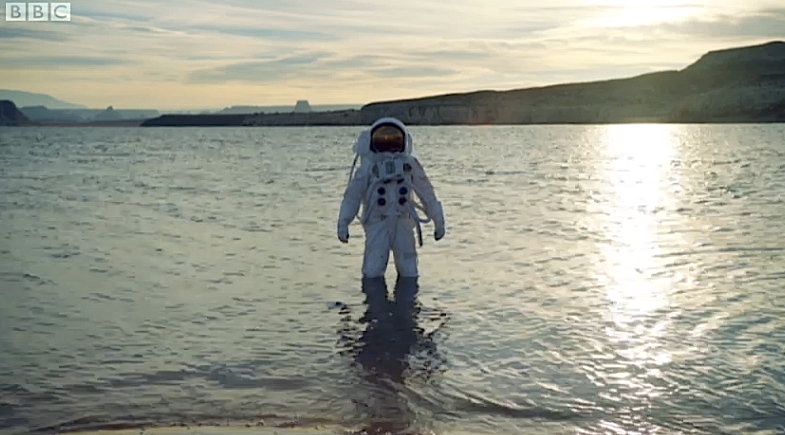 But the Doctor suggests something darker at the heart of man's achievement of landing on the moon and an alternate scenario that not many will care to remember (perhaps by dint of the Silence's activities). 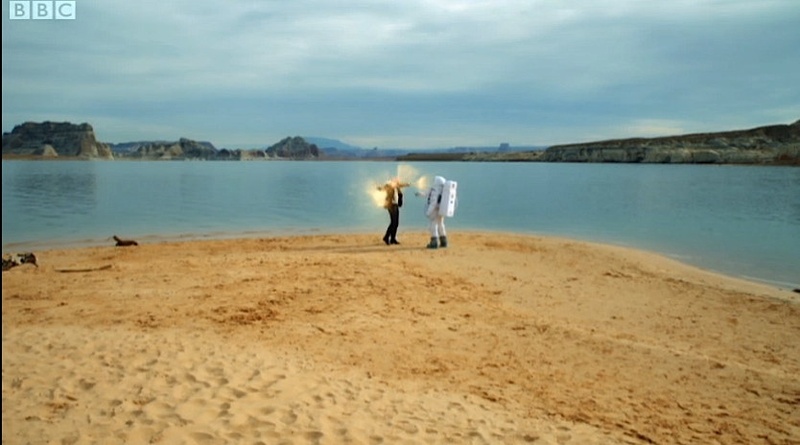 Coupled with an out-of time Doctor is the appearance of the said astronaut, with Moffat again signaling that what we are seeing is actually the end of the story out of which will spin the following thirteen episodes. The death of the Doctor is the tragic inevitability of what will be this year's time bending paradox, fished out of Moffat's trusted box of tricks once again, which will see the 908 year old version of the Doctor and companions Amy, Rory and River attempt to 'rewrite' the events we see on screen. This is more of Moffat's narrative deviation in that we know the death of the Doctor isn't actually that important but the journey to restore him (as sure as night follows day in the series) will answer questions about Amy's pregnancy, River's identity and the secrets between her, Rory and River and is the meat of Moffat's premise. 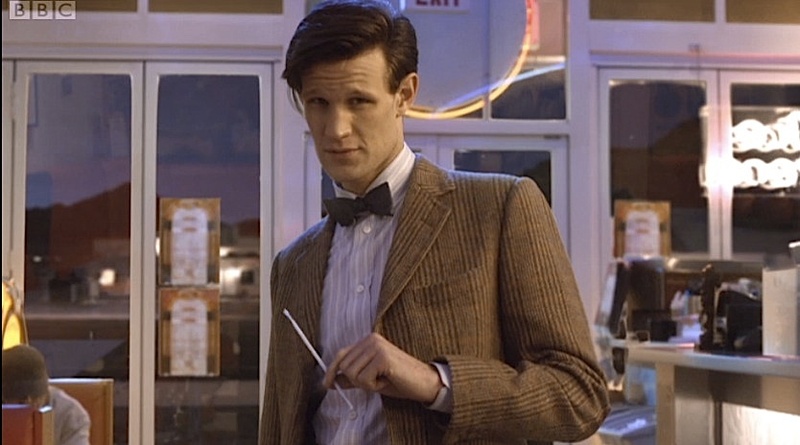 As the Doctor starts to regenerate, there is a sense that he already knows his own fate and that his summons to Amy, Rory and River is precisely calculated, down to inviting his younger self to the diner in the aftermath of his death at the hand of the astronaut. One of the problems with stories of this nature is there is an inclination not to emotionally invest in the characters and situations and, here, the danger is that the death of the Doctor is just an affectation, as much as the Tenth's faux regeneration in the climax of The Stolen Earth turned out to be a masterful example of audience and media manipulation, depending on your point of view. There's a hint of that going on here but that feeling is soon dissipated when the story proper gets underway. What's good to report is that the shooting of the Doctor gives Karen Gillan a genuinely affecting scene that suggests the brashly cynical and conceited Amy of a year ago has matured into someone we can empathise with, building on the foundations of similar sequences such as the deaths of Rory in Amy's Choice and Cold Blood. Certainly the domestic scenes between Amy and Rory earlier in the pre-titles sequence offer a welcome sense of stability and thankfully there are no signs of Amy's demeaning attitude towards both Rory and the Doctor that made her so difficult to get on with in Series 5. Her grief over the Doctor's 'death' is wonderfully communicated in Gillan's physicality, first huddled up, trembling with grief and then hugging the Time Lord's inert body, Amy's tearful frustration and disbelief vocalised in "Wake up, go on wake up, you stupid bloody idiot!" Gold scores this and the Viking-style funeral boat sequence with a beautiful vocal passage akin to Ennio Morricone's score for Once Upon The Time In The West and the wordless vocals by Italian singer Edda Dell'Orso during the theme music for the Claudia Cardinale character. 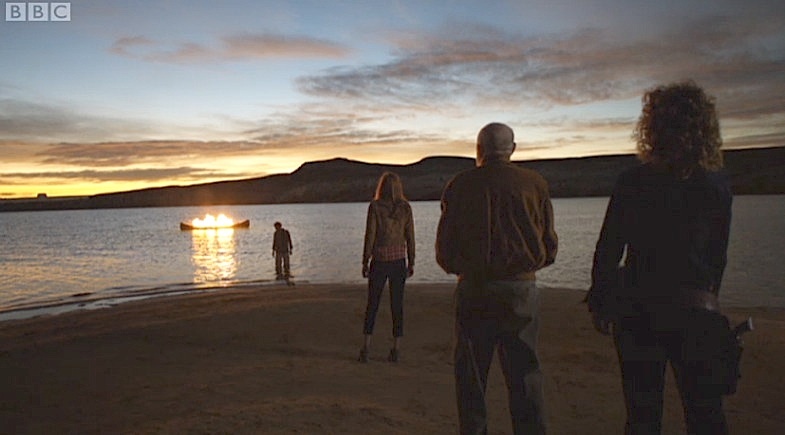 This is matched with stunning imagery of the boat on fire on Lake Powell as the three companions stand watching in the company of the old man who has also been summoned to the spot as a further witness. It's only at this point that River asks the question we've all been dying to know the answer to and discovers that this is Canton Everett Delaware III. 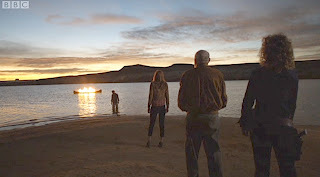 When they meet the now 909 year old Doctor back in the diner (the older Doctor having invited his younger self to the funeral, so to speak) we begin to unravel the circumstances that have brought us to this point as well as the nature of the secret - the Doctor's own death - that Rory, Amy and River must keep to themselves. "Spoilers," River intones in response to the Doctor's question about who has recruited them for this particular mission. Another genuinely good aspect to this is that Rory really comes into his own again, fathoming out the conundrum of the future and present Doctors and explaining it to Amy, and suggests that the character is no longer the man so easily patronised for his lack of intelligence and bravery we saw in Series 5. Back in the TARDIS, as the companions all attempt to work out if the Doctor has invited them to avenge his death or simply to save him, there's a wonderful and amusing counterpoint to this, reflecting on the reductionist role of the companion to 'pass the Doctor his test tubes and tell him how wonderful he is', as the Doctor sticks his head beneath the console and berates them for their inattention, "I'm being extremely clever up here and there's no one to stand around looking impressed. What's the point in having you all." I suspect that we'll see why his companions are so important to him in this series because as River explains, in a moment that underlines her role as the series's femme fatale symbol, "The Doctor's death doesn't frighten me. Nor does my own. There's a far worse day coming for me." Moffat works in a similar gag about the Doctor's cleverness and his and River's relationship later in the episode, once again using the now familiar Tracy and Hepburn screwball comedy banter, when the Doctor figures out the street names as a location for the lost child calling the White House. The Doctor observes, "Dr. Song, you've got that face on again." After enquiring to which face he is referring, River is informed that it's the "he's hot when he's clever" face. "This is my normal face," she responds and the Doctor calls her bluff by declaring that indeed it is her normal face. She promptly tells him to shut up. Deliciously witty material. The femme fatale nature of River is certainly not lost on the Doctor and as he confronts his companions about the secrecy of their mission ("I know you know. I can see it in your faces") and River demands that he'll have to trust them for a change, he asks her "Now I love a bad girl, me, but trust you? Seriously?" It is down to Amy to win him over and the only way she can persuade him to carry on is to swear on the bond they formed when he met her as little Amelia and he ate fish custard in her lonely house in Leadworth. "My life in your hands, Amelia Pond," he responds, instantly acknowledging their symbolism as Peter Pan and Wendy, the magic of believing in fairies and that by clapping your hands you can bring those that have died back to life again. Again Gillan is rather good in this scene, quietly acknowledging that the deal Amy has brokered is going to have serious implications throughout the series. It helps ground the character and build on that much-needed emotional depth that only really emerged part way through Series 5 last year. If there is key word here for all the performances and characters, then it has to be maturity. There's a great jump cut from the Doctor declaiming "Canton Everett Delaware III! Who's he?" to the FBI men asking the same question of the man at the bar in Washington and thus introducing us to Mark Sheppard as the said gentleman (and fittingly Sheppard's father, W. Morgan, a television and film genre veteran, played the older Delaware in the Lake Powell sequence). His introduction is criss-crossed with brief snippets of exposition in the TARDIS and his own conversation with the President in the back of a car. 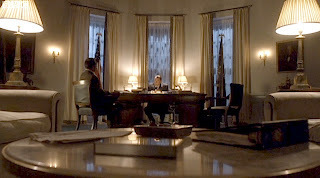 Nixon's appearance and the wonderful Oval Office set evoke the Watergate themes of Frost/Nixon (2008) and Oliver Stone's biopic Nixon (1995), imbuing the story with conspiracy thriller motifs and some barbed political comments such as Delaware's open admission to his boss that he was his second choice for President. 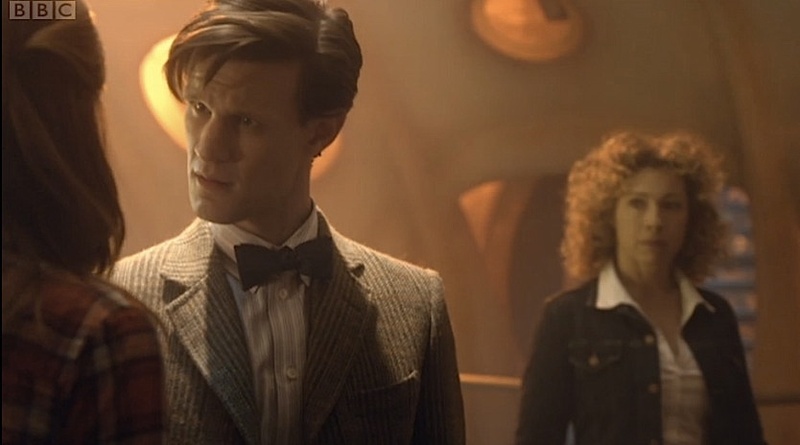 Even the Doctor and River are somewhat polarised (his 'hippy' to her 'archaeologist') in their opinions, with River conceding that there was "some good stuff too" apart from the disasters of Vietnam and Watergate then rejected by the Doctor's cynicism of "not enough". 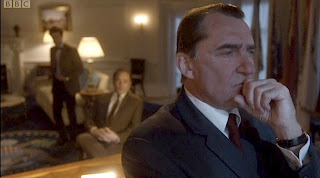 Stuart Milligan makes a good Nixon, complete with a spectacular prosthetic nose, and he seems absolutely at home on that Oval Office set. There's also a nod here to the BBC website's on-line prequel as Nixon explains to Delaware that he's been receiving some mysterious direct phone calls from a child. After some lovely physical comedy and banter over the efficacy of piloting the TARDIS, the Doctor, with the surreptitious help of River ("just admiring your skills, sweetie"), manages to set the TARDIS to silent running and land it invisibly in the Oval Office. Eavesdropping in on the playback of a recording of the phone call, the Doctor witnesses Nixon's growing sense of paranoia over whom to trust. 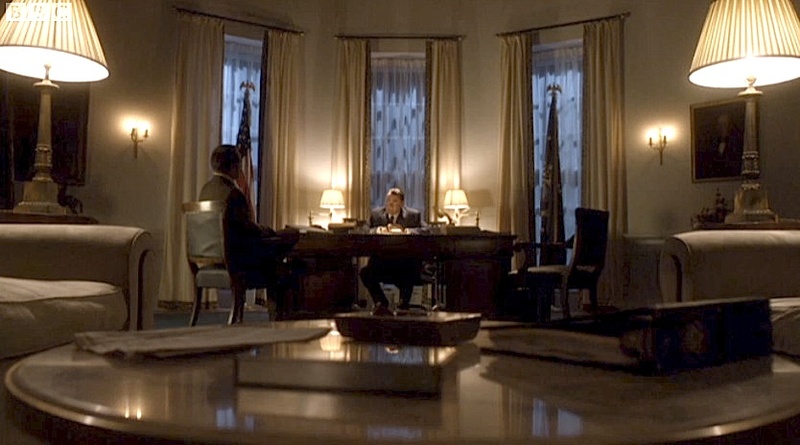 Kudos should go to Matt Smith in this scene as Nixon quietly explains events to Delaware with the Doctor scribbling down notes and quietly unaware that the two men have noticed him standing there. It's an acknowledgement of how well Smith can handle these elements of comedy when the Doctor starts to furiously back peddle. "Oh, look this is the Oval Office. I was looking for the Oblong Room. I'll just be off then shall I?" he exclaims with faux incredulity while crashing into the furniture and knocking himself senseless on the invisible TARDIS. 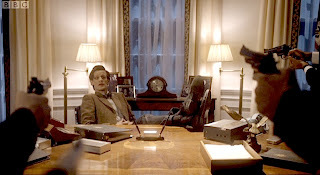 Great moments keep building one on top of the other, securing Moffat's reputation for brisk comedy, as the Doctor magically slips out from under the FBI men's lock down and parks himself, with his feet up, at Nixon's desk; as Rory, leaving the TARDIS, tells the FBI men that they are "very much not in need of getting shot" and the Doctor cheekily sums up his little team of top operatives as "the Legs, the Nose and Mrs. Robinson." 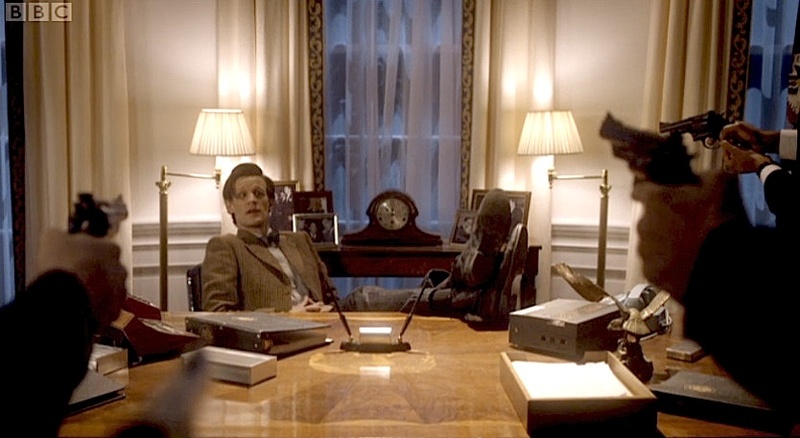 And look at that note of disappointment on Smith's face as the Doctor's request for a SWAT team, a pot of coffee, 12 jammie dodgers and a fez remains unfulfilled as Delaware only sanctions the availability of maps. As they all pore over maps and deduce that the 'Spaceman' mentioned in the child's phone calls may originate at NASA in Florida and be the same astronaut that killed the Doctor by the lake, Amy has her next encounter with the Silence in the West Wing's loos. It's a truly unsettling sequence as she first spots one of them, remembers her sighting in Utah, and goes off to the restroom on the pretext that she's feeling a little sick. The significance of this scene is that she is, of course, sick as a result of her pregnancy rather than as an effect of seeing one of the Silence. 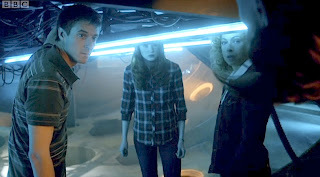 Although Moffat does deflect that for a while by suggesting the Silence simply make people unwell after they are glimpsed in the corner of your eye when River feels unwell after exploring the warehouse hive where the Silence live. It's only when Amy later reveals her pregnancy that this subterfuge on Moffat's part is seen a typical piece of his scripting misdirection. 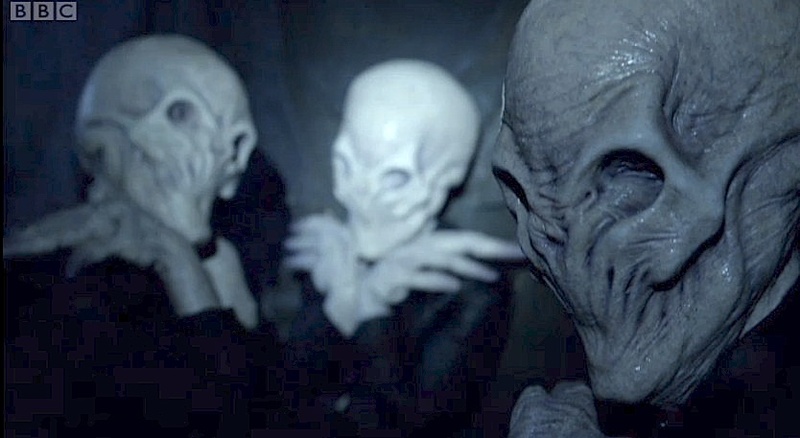 The Silence certainly have the potential to join the Weeping Angels as Moffat's enduring contribution to the Doctor Who mythos, their trick of making you forget them as soon as you turn your head is as effective as the 'don't blink' mantra that worked so well before. 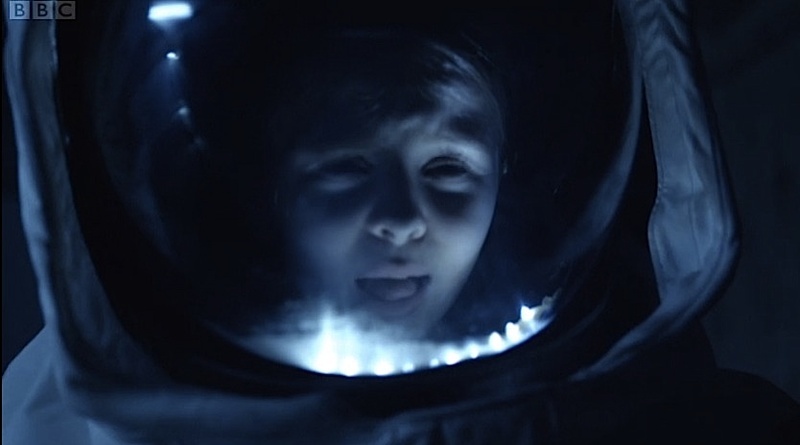 It's another iteration of terrors that are directly linked to how you see or don't see them and throws in a nightmarish sense of déjà vu, best seen as Joy, a member of staff coming out of the loo, cycles, meme-like, with Amy in her encounter with the Silence only to be spectacularly obliterated by it. When Amy asks why it had to kill her, it responds with "Joy" suggesting that it simply found the experience a pleasurable one before the meaning slips and it confirms that the woman's name actually was Joy. Amy's distress is compounded by the fact that she forgets the entire incident when she returns to the Oval Office. 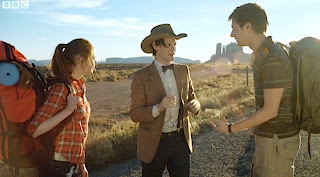 Traveling to Florida to find the caller, now with Delaware aboard, we have Rory on TARDIS 'bigger on the inside' explaining duties, amusingly only getting as far as space travel before they land and start to explore. Delaware is more concerned about how long Scotland Yard have had this police box that can travel in time and space. 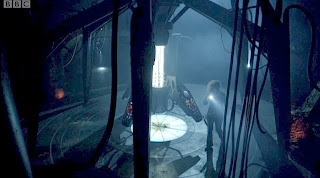 In an abandoned warehouse full of alien technology and stolen NASA gear (an atmospherically, haunted house styled Gothic space), River and Amy once again discuss the nature of time paradox, each having thought that they could change the future as seen in 2011 by neutralising the astronaut in 1969. River warns that not all time can be rewritten in the way that Amy hopes. The Gothic space is further explored when River descends into the symbolically ruinous and rotting realm of the Silence, filled with their slimy presence and, just as Joy experienced in the White House, both River, and later Rory, enter a state of uncanny déjà vu, where the classic Gothic effects of doubling and the repetition of coincidence are felt once more. "...he won't have the faintest idea of who I am. And I think it's going to kill me." It's also a realm of secrets too as Rory takes an opportunity to ask River about "the worse day" she predicts is coming for her. We get a further glimpse into when the Doctor first met River ("he knew all about me") and how that meeting affected her. 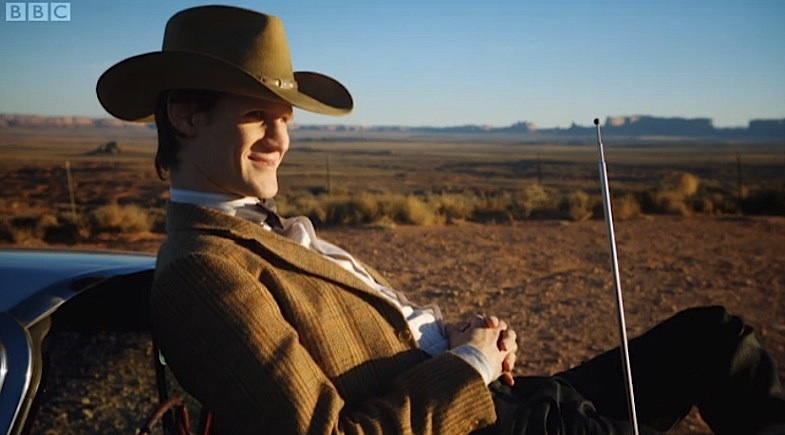 Here Rory notes the parallel to Amy meeting the Doctor with River's own description, "Impressionable young girl and suddenly this man just drops out the sky, he's mad and wonderful and knows every last thing about her. Imagine what that does to a girl." Indeed, it could be said that the whole of Series 5 dealt with that intense relationship between the Doctor and Amy. River also signals her ultimate fate as she describes how she and the Doctor travel through time in opposite directions away from each other, one hurtling into the future and the other falling back into the past and where, as we saw in Silence in the Library and The Forest of the Dead, the Doctor will have his first encounter with her, knowing nothing of her, and she will "look into that man's eyes… my Doctor… and he won't have the faintest idea of who I am. And I think it's going to kill me." It's a very poignant moment, emphasising the sadness of her fate by showing us the milestones of her life through the Doctor's eyes, traveling backwards from her own death. 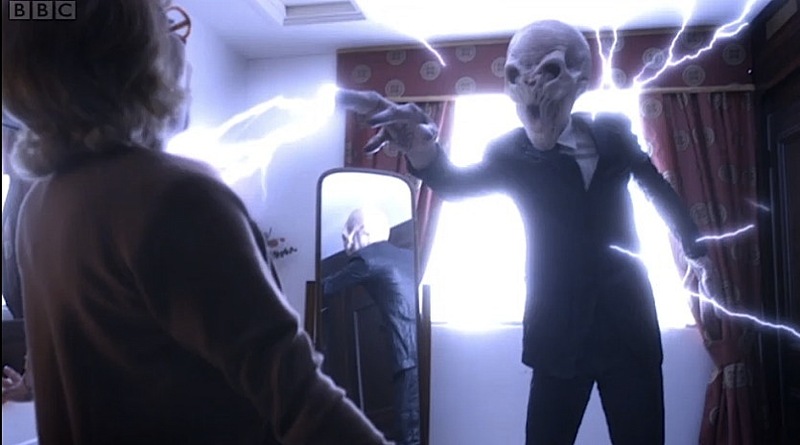 The cliffhanger to the episode is well constructed as significantly, River and Rory then break into the TARDIS-like ship last seen in The Lodger, simultaneously knitting together and expanding upon the series continuity. 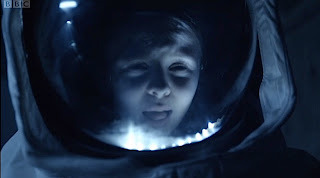 This suggests the Silence had a connection to the events in that episode and it builds on the mystery remaining about the ship. 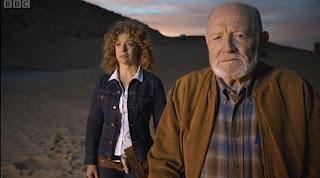 As Amy and the Doctor finally encounter the astronaut after Delaware has been knocked out, River discovers that the tunnels housing the Silence run under the entire surface of the Earth and that they are very old. We are left with the feeling that the Silence have been entwined within the Doctor's life and the fate of the Earth for some considerable time. When Rory sees the Silence, there is an explosion and he seems to vanish, while Amy reveals to the Doctor that she's pregnant (she picks a fine time, doesn't she?) and then uses Delaware's gun to shoot the astronaut, perhaps still thinking that by killing the creature it will save the future Doctor, just as its visor opens to reveal the girl inside the suit. A good solid start to the series with some spectacular location work in Utah that benefits the cinematic approach, beautifully realised sets and lighting all enriched by Stephen Pehrsson's cinematography. It leaves us with enough intriguing mysteries and clues to fuel this year's major story subtexts. The regular cast are all excellent and Delaware, as played by Mark Sheppard, is an interesting character who will hopefully get a lot more to do in the second part of the story, Day of the Moon. Enjoyed reading your review, Frank. Another excellent, on the money review, Frank. I enjoyed this episode far more than any in the last series so have high hopes. Thanks for the comments Tom and GC. I thought it was a good start, perhaps not as exhilarating as 'The Eleventh Hour' but certainly very welcome in the way it handled the characters. I really enjoyed the episode. But I do have a question -- how do we know that these particular guys are the Silence? Although they are not named in the episode, the coverage of the new series on and off-line has pretty much identified them as the Silence. In fact, the Radio Times printed a photo of one of them and categorically stated it was 'the Silence'. Like GC, I enjoyed this episode of Disney's Junior Dr Who more than any from the last abortion, but then I arrived with rock bottom expectations. 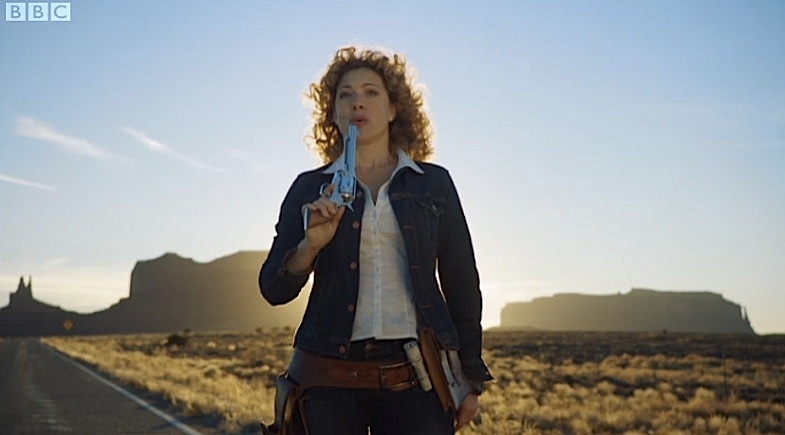 At least, in River Song, we had one grown up, although there were the usual kid's show performances from the guys playing the Americans, and I had to start banging my head against the nearest brick wall until it was a bloody stump when I heard those words, "I'm pregnant." No, no, no, kill me now, please. Most thoughtful review I've read. Thanks. Another great review, though I have to wonder if the future Doctor sent those invites (there may have been a clue in there pointing otherwise). It's great fun to speculate about the various mysteries, and your observations on some of the broader influences and themes was really enjoyable. Wonderful review! I can now go and enjoy your review of the head-messing follow-up episode! Great review as ever, Frank. Intelligent and free of those words from lit crit textbooks which fill some people's reviews and which just make me want to lie down with an icepack on my head.